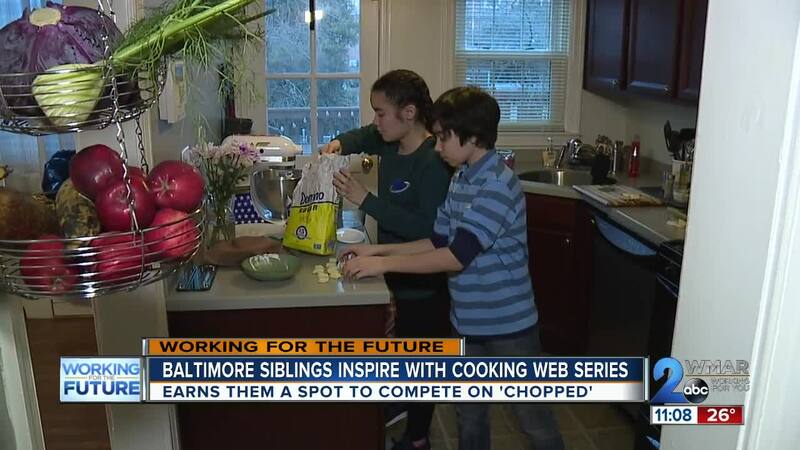 BALTIMORE (WMAR) — A Baltimore brother and sister team have created their own culinary community online, combining cooking and culture in a fun web-series. It's helped earn them a coveting spot on a cooking show that inspired their passion. Sara, 15, and Sammy Baunoch, 13, started hosting a weekly Sup! kids cooking web-series almost 3 years ago, to inspire other kids to try new things in the kitchen. "You can use your creativity. It doesn't have to be exactly from the recipe and it's just a lot of fun," Sara said. They make different dishes from around the world, showing the process live on Instagram and then posting a tutorial on YouTube and just last week, they put out their first e-cookbook on Amazon called Snackation . "Sara wrote the book and I illustrated all the pictures in the book," Sammy said. "It's been something we've always wanted to do is share the recipes that we make," Sara said. "Our grandma showed us the Food Network and then we just got addicted. We kept watching all these shows, especially 'Chopped'," Sammy said. Being on a show they draw so much inspiration from was just a dream... until they got an e-mail from producers who saw their videos, asking them to be part of a special siblings episode. "It hasn't really even sunk in very much," Sara said. "We are very competitive together and also against each other sometimes but we've always dreamed of doing something like this together on a cooking show. It's good because if there's something I don't know how to make, Sammy will and the opposite." You can catch the episode airing on the Food Network at 9 p.m. Thursday.